As a child, I explored the fields and woods of northern New York State for many hours  upending rocks, wading in streams and ponds  always amazed at the small wonders and hidden surprises of nature. That same love of the natural world has followed me into adulthood and has been reflected in my lifestyle as well as my creative works. I am a trained silversmith and enamellist, but after taking a pottery course just for fun, I fell in love with clay! It wasn't long before I created a home studio complete with pottery wheel, kiln, and a wonderful view of my woods. The earth on my hands connects my imagination with the myriad magical creatures and plants I have discovered while kayaking or hiking  they come home in my mind and go on a pot! 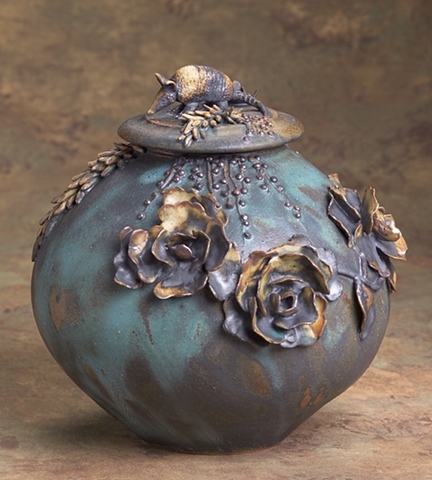 I am delighted when someone holds one of my pots, turns it around in their hands and smiles. I consider my creativity a gift and strive to remain forever grateful and teachable, remembering that my inspiration is only an interpretation of the already existing natural world.